Copyright 2009 The Chathura Project Authors. Chathura was developed initially as an ASCII font in 2009 in the Ezi Fonts collection, which consists 42 Telugu ASCII fonts. 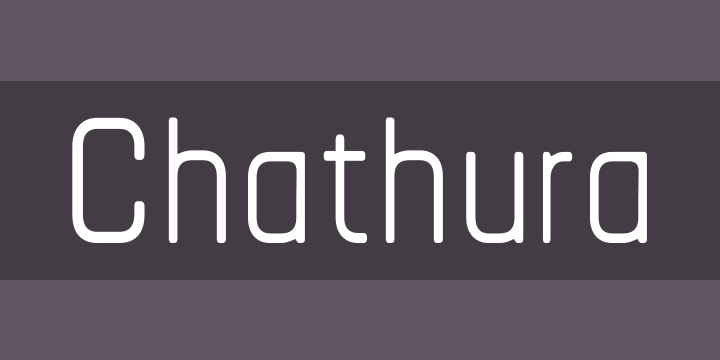 In 2015 Chathura was developed into a Unicode font family with support for Telugu and Latin. The design is useful for invitations, headings, in print and on the web. Each letter has rectangular forms and a uniform stroke thickness. The Telugu component was designed by Appaji Ambarisha Darbha. The Latin component was added from Rajdhani, a Latin and Devanagari font family developed by Shiva Nalleperumal at Indian Type Foundry.